If you're a child of the 70s, you probably attended a Snoopy party or two growing up. But these days, the Peanuts gang has taken a backseat to Mickey Mouse, Dora the Explorer, Thomas the Tank, Spiderman and SpongeBob SquarePants. If you're raising a fan of Charlie Brown, Snoopy and Woodstock, there's good news for you. 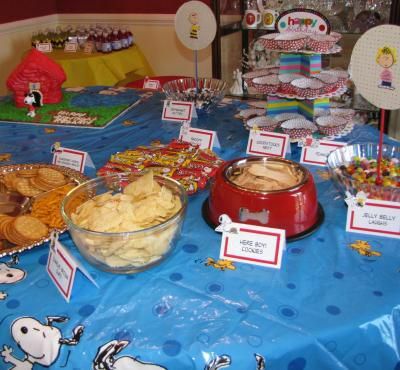 You can throw a Snoopy party today that's even better than the parties of yesteryear. With a little legwork, you can host an inexpensive party featuring the Peanuts gang. From the food to the party games, all of the ideas you need for a great Snoopy party are on the following pages. They've also been fully tested and kid-approved. Create your own Snoopy invitations to save money and make unique invitations that will get your guests excited about coming to your party. You'll make them feel like V.I.P. 's -– Very Important Peanuts! The back of your lanyard will have your party guest's name on it. So, on one side you'll have the Snoopy invitation with the party details and the reverse side will show the guest's name. The idea is that each child will wear the V.I.P. pass with his or her name on it to the party. The lanyard can serve as a V.I.P. pass and also a name tag. Be sure to print some extras in case a guest or two forgets the pass on party day. The lanyards will need to be mailed in an oversized envelope. Be sure to add extra postage. Some Peanuts birthday party favors you can find in stores. Others you may have to make yourself. Most of these party favors, such as the Silly Bandz, pencils and stickers, all came in a pack. By breaking the pack down to one or two items per child, you also cut the costs of your party favors. Kids walk away with Peanuts birthday party favors they'll love and actually use without you spending a small fortune on these items. Target and Walgreens are great stores for Peanuts goodies you can use at your party. Some online party supply stores carry Peanuts and dog-themed party items. Also search Oriental Trading and eBay. There are so many Peanuts activities you can incorporate into your party. Any dog-themed party activity will work but some can be specific to Peanuts. For each guest, cut a dog bone shape out of white posterboard before party time. Use raised black letter stickers to spell each child's name on the dog bone. As kids come in the door, they can decorate their dog bone using Peanuts stickers, Peanuts rubber stamps, crayons or markers. This activity keeps kids busy while you wait on all of your guests to arrive. Use banner paper to draw a large Snoopy. Cut a Snoopy tail out of black felt for each one of your guests and attach tape to the back. Blindfold each child as they take turns and play pin the tail on Snoopy. You can also buy a Snoopy poster. Hang the poster and use removable tape on the backside of your felt tails so the tape won't damage your poster. After the party is over, hang the poster in your birthday boy or girl's room as a keepsake from the party. Play a new form of hot potato. Use a small stuffed dog as your hot potato. You can even use a small Snoopy stuffed animal for this game. Any music will do for your Pass the Pooch game. Or stick to your party theme and play the famous Linus and Lucy song, cutting the music on and off until you have a winner. Many party supply stores sell bone-shaped pinatas. Or make your own piñata to save about $10-15. Fill the pinata before party time and hang it low enough for your younger party guests to reach. Everyone should take turns hitting the pinata until it breaks. Not every activity has to have a prize. Kids can play for fun. If you choose to give away prizes, make sure everyone gets something just for playing. This is especially helpful when you have younger guests who won't understand why they're not getting a prize. You can find dog-themed items in bulk online that are inexpensive and can serve as great prizes for everyone. For example, a sack of Snoopy cupcake rings can be given away to each child as a prize and you'll only pay a couple of dollars for 24. For grand prizes, check Amazon for Peanuts DVD and book specials. Often, you'll be able to find DVDs or books for just $5 each. When the guests are getting too rowdy, instantly settle them down with a Peanuts movie. Have your chairs set up like a movie theater and usher the kids to their seats. Pass out popcorn, hit the play button on your DVD player and know the kids will be occupied for at least half an hour. For adults, Snoopy decorations and food may just be the most fun part of the party. The Peanuts gang gives you plenty of creative options to stick to your party theme. Keep an eye out for items you can use as Snoopy decorations. Snoopy balloons, Peanuts tablecloths, plates, cups and centerpieces can easily be found online. With so many dog-themed birthday party supplies, it's simple to find paw print, dog bone and other dog-related party ideas you can use for your Peanuts party. Some of the best resources for puppy party supplies are online birthday stores. Paw prints are easy to draw. One of the most simple decorations for your Peanuts party is to draw paw prints leading up to your front door with sidewalk chalk. Make name cards for your food out of Peanuts clip art. You can even find a free Peanuts font for download. Each container used for our party was a 0.5-liter bottle. You can buy a 12-pack of these small bottles of water for less than $5. The bottles for Peanuts Punch and Good Grief Green were emptied. While waiting for the bottles to dry, we created bottle labels using Peanuts-themed clip art and regular paper. Use the bottle's original label as a guide to cut your version of the label to size. Before applying the new labels, fill your bottles with the two flavors of Hawaiian Punch. All you have to do now is rip off the water bottle's label and the glue left behind will be more than enough to make your own label stick. Search for "Snoopy cake pan" or "Peanuts cake pan" to see what kinds of cakes you can bake. Or buy a dog house cake pan and a Snoopy cake topper set. For our party, we doubled the dog house cake pan recipe to make the dog house have a front and back. For extra flair to your Peanuts party, bake two chocolate chip cookie dough rolls to serve as the base for your cake. Bake them in square pans and they will look like dirt and rocks when they come out of the oven. Place your completed dog house on top of the flat cookie dough after both have cooled. Snoopy's dog house now looks like it's on the ground. Use green frosting to fill in the grass, blue frosting to give Snoopy a pond and frost your dog house. Guests now have the option to eat Snoopy's dog house cake, frosted chocolate chip cookies or both! Be sure to take a group picture of all of the children before they leave. Also, take a picture of your child with each party guest. Once the party-goers have gone and you've had a chance to clean up the mess, make sure your birthday boy or girl takes the time to send thank you notes. Buy Peanuts-themed thank you notes, create your own using clip art or ask your child to draw Snoopy on each guest's thank you card. Print copies of the group picture and the pictures of your child with each guest. Include a group picture and a picture of your child with that guest in the thank you card. Encourage your kids to write thank you notes that are personalized for each person who attended the party. Even if you asked guests not to bring gifts, let your child send a thank you card to simply thank the guest for coming over to spend time at your house. Younger children will love getting something special in the mail and, even if they're too young to fully appreciate the thank you card, their parents certainly will!